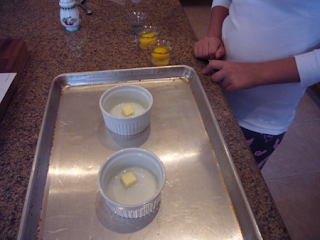 Cooking With The Kids: Barefoot Bloggers - Our first week! Welcome to our first week of the Barefoot Bloggers. We have been so excited to get this post up! First, we'd like to thank Tara from Smells Like Home for allowing us into the super-cool event. She seemed excited that we wanted to join - we really like Ina Garten's recipes since she doesn't make anything strange or unusual. 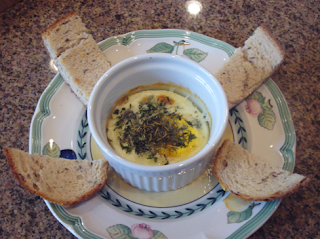 Our first recipe for this event was Herb Baked Eggs. Now, we usually eat eggs as an omelette - so this was something totally new. Sabrina here: I wasn't sure about this, but my mom said, if you don't try you'll never know. She says that a lot. Alexander here: I like to try new things so this should be interesting. Now Alexander made himself scarce that day (Guitar Hero 3 anyone?) so I (Sabrina) made the eggs with my mom. She just sat with the camera while I did all the work!! Aren't there laws against that? 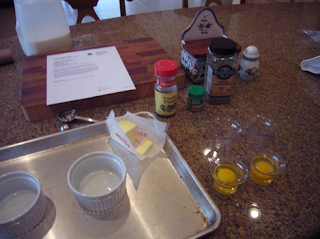 So first, I read the instructions and laid out the ingredients. 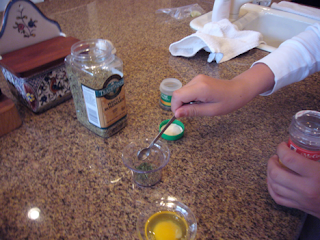 Then, I measured out the herbs - we didn't have fresh, so I used dried. 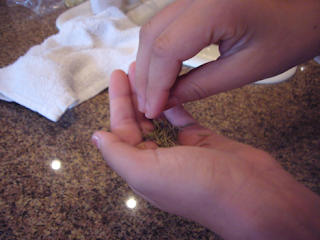 I crushed up the rosemary so it wouldn't stick you like a pine needle. I put the butter and milk in the ramekins. My mom said these wouldn't crack under the broiler. She usually makes creme brulee with these. Hey Mom, why haven't you made creme brulee lately? 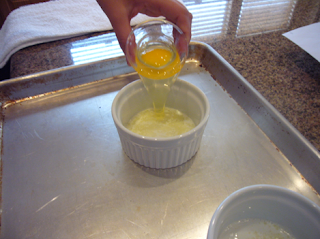 Next I cracked the eggs into the hot ramekins. Oh, I forgot, I preheated these under the broiler to melt the butter. 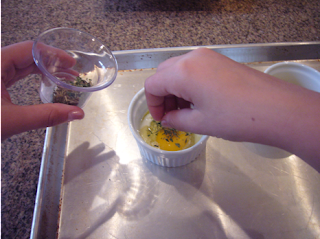 Then I sprinkled the herbs on top of the eggs. I didn't realize that I wasn't supposed to use all of it - well, they'll be extra herb-ish. That's a word I just made up. Do you like it? 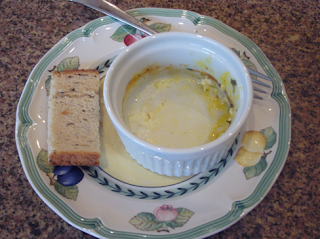 This is how I presented it to my dad - with rye bread - his favorite! I think I'll make this for him for Father's Day - he'd really like it! Well, thanks for visiting our blog - the next recipe up for Barefoot Bloggers will be Pasta, Pesto and Peas. Three p's - ha ha ha ha!! Great job on the eggs. I may have to try these. I only eat eggs, fried, scrambled, or in an omelet, so this would be something different for me too! Great job! Did you like them? Great job Sabrina! Did you make any for yourself?? Way to go on your eggs! I can't wait to try them tomorrow. These look great. It is always nice to get a rave review in the form of an empty dish.